Lyndsay Smith, Fiona Taylor, Janine Norris - all Fife Sands, Pamela Galloway - Midwifery Manager, David Torrance MSP, and front, Heather Slattery, Cathy Roberts, Mike Roberts and James Slattery - the main fundraisers, at the opening of the new bereavement suite at Victoria Hospital in Kirkcaldy today. The bereavement suite will provide a private place where parents can spend time with their child and receive care and support to help them come to terms with their loss. Stillbirth charity Fife Sands, which last year celebrated its 25th anniversary, has been at the forefront of the plans and has helped to raise thousands of pounds towards the project. The suite has been developed in consultation with people who have experienced stillbirths, who have offered advice on how to make the room as comfortable as possible for. Staff from NHS Fife and representatives from Fife Sands were there for the official opening yesterday. Fife Sands chairwoman Janine Norris said she hoped the room would offer parents a sanctuary where they can try to come to terms with their grief at their own pace. “Fife Sands are delighted and proud to finally have the refurbishment finished,” she said. “We couldn’t have managed it without the wonderful families who have given so much of their precious time to volunteer with Sands, to raise funds and use their own devastating losses to make things that little bit easier for other parents going through the worst moments of their lives. “Refurbishing this room means so much to us. We want to help make the room feel more homely for families having their last precious moments with their baby. Kirkcaldy SNP MSP David Torrance was also on hand to mark the milestone, describing the occasion as “extremely emotional” and a privilege to attend. “This facility will allow parents to focus on spending as much precious time with their child as they can with as little interruption or inconvenience possible,” he said. “The ability for partners to get a proper night’s sleep or to make a cup of tea without having to leave the room can make all the difference in such an emotional and stressful time. 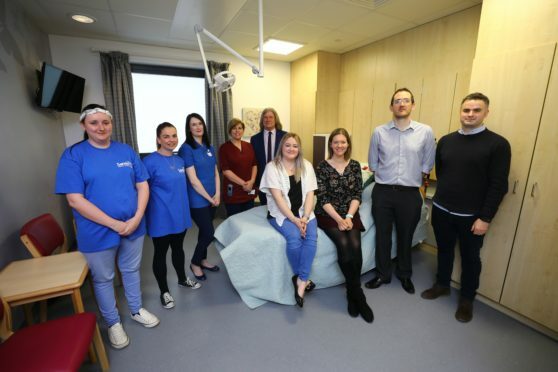 Dundee’s Ninewells Hospital already has a similar facility, the Tulip suite, where families who suffer a loss can spend time and have photos taken with their baby.